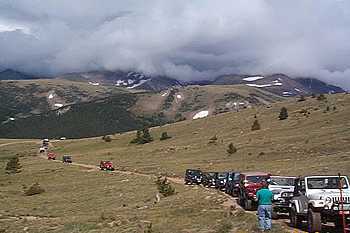 On Saturday July 13th, 2002, the HoboJeepers hosted the 4th Annual Hobo Run 2002 for 28 "Hobos for a Day" over the Kingston Peak Loop Trail. "As real hobos ride the rails, we too ride the trails in that same traveling spirit". A hobo needs to muster up needed supplies in order to survive on the trail. Each checkpoint offered the hobo a chance to collect different point values from the items (fresh egg, plastic spoon, toilet paper square, Q-Tip, stick of gum, and a hersey kiss). Along with the items, a card is chosen at the other 5 checkpoints to try to have the highest poker hand for extra points. 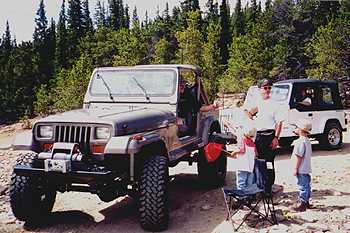 Eugene the Jeep (our little mascot), was also on hand in the area. At the second checkpoint, "Where's Eugene?" clues were handed out to each hobo and read out loud over the CB as to his possible whereabouts in the area. A hobo could receive 200 extra bonus points with the right answer. This year he was in Idaho Springs. Each item was stored in souvenir traveling bandanas, and at the lunch spot, all the points were totaled up and trophies along with door prizes handed out. 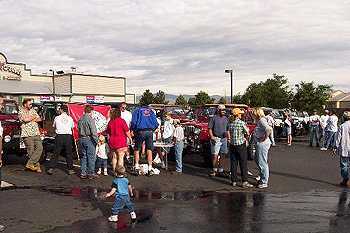 The trail actually started at IHOP at 6th and Simms in Lakewood, Colorado at 7:20-8:40am with registration for the run. Since everyone had already pre-paid, registration consisted of only signing in and picking up you're goodie bag. The goodie bag contained a souvenir silk screened bandana, a magnetic dash plaque, door prize ticket, a nut, and sponsor brochures. 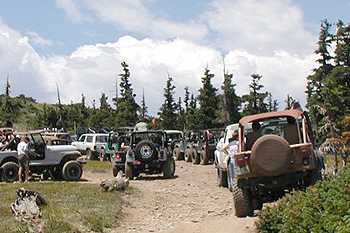 Everyone was excited for a fun day, and a 'different' day of jeepin'. After a quick driver meeting at 8:45am, and an "official" hobo swearing in ceremony, we were off parade style up Hwy 6, and west on I-70. 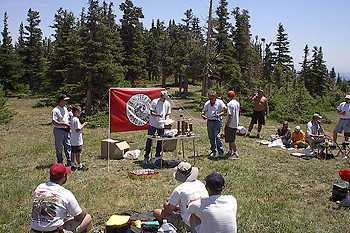 Hobos were given an instruction sheet which covered the rules to read on the way up to the trailhead. Thanks to all of you ("Hobos for a Day") who supported us in this years run including our corporate sponsors. The "Hobos for a Day" included Dennis and Marci E (MHJC Patrol 11), Todd F (MHJC Patrol 11), Tony V (MHJC Patrol 11), Zane and Dale Z (MHJC Patrol 14), Brent H (MHJC Patrol 14), Eric L (MHJC Patrol 14), Frank E(MHJC Patrol 14), Robert S (MHJC Patrol 12), Neil & Jill M (MHJC Patrol 14), Debrah L, Alex L, Sever K (MHJC) Scott K (MHJC), Jeff D, Mark F, Chuck B, Amanda H, Paul S, Alex C, Rick L, Tim S, Guy B, Bob A, Larry N, , Don D, and finally Jonathan G.
The trophies and prizes are much bigger this year! Now here's a neat sight! 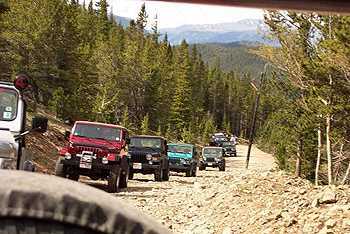 Picture 35 (27+8 HoboJeepers) good-lookin' jeeps running up I-70 all with their lights on in line, it looked cool from the front were I was! 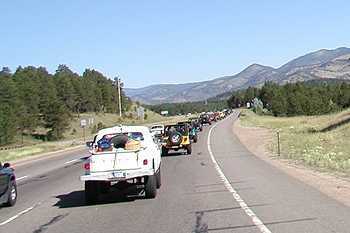 We managed to stay within about a 2-mile stretch of each other too, and nobody broke down! Yea! I think it took about 10 minutes for the CB introductions. 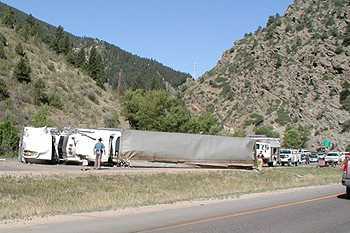 We had a slowdown at the bottom of Floyd Hill where a semi had layed down and dumped it's load of fruit all over the opposite lane. Once off I-70 and up the more peaceful Fall River Road, we worked our way up to the summer town of Alice at about 10,500' in elevation to the air-down spot. 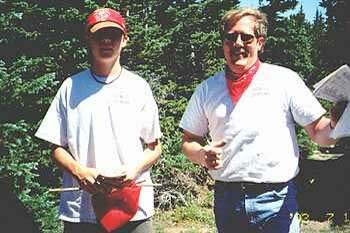 Drew Middleton helped me with the dispersion of the fresh eggs as the hobos air-downed for the trail. You didn't get points for your egg if it was broken by lunchtime, so many tried sneaky methods not to break it! All items though needed to be in their traveling bandanas on a stick. All Aboard! 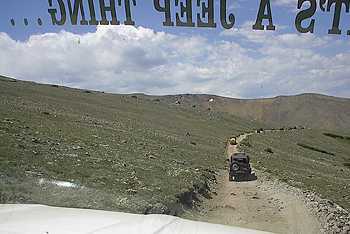 One by one the train of hobos chugged/jeeped up the hill (with some pretty rocky stuff), as each hobo followed the trail to places unknown and a fun day. 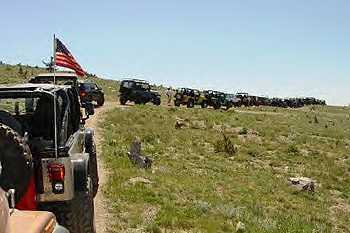 Each of the HoboJeepers were at 5 other checkpoints as the 'train' of Hobos passed by to provide items for each hobo. 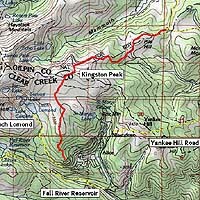 We all made the turn at Jed and Jason's scenic checkpoint at the base of Yankee Hill, and headed into the tight-tree lined trail along the east-side of Kingston Peak. 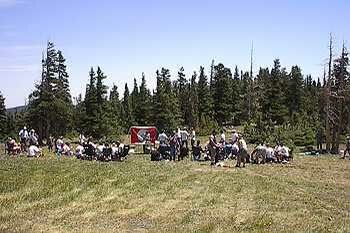 Each Hobo received a 'Where's Eugene' clue at the 2nd checkpoint, and read it over the CB. Most everyone figured out where he was after the 30th clue (he was down in Idaho Springs). Then we passed the next checkpoint to receive the next item and card, and so on. We stopped for a 10-100 on the east side of Kingston Peak in the trees, and Drew had a stick of gum for the Hobos. It took about 10 minutes for the end of the line to catch up. 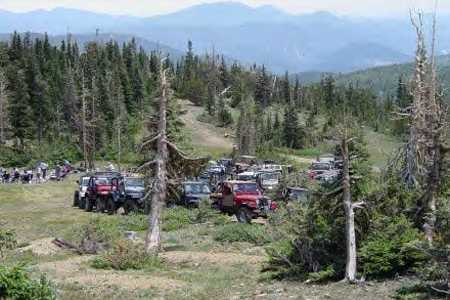 I know 2 guys on motorcycles came up on me on the trail at the front, and when I told them I had 34 Jeeps behind me with nowhere to pass they turned around and peeled away. At one point we were strung out over I'd guess over a mile on the trail. All the while I rarely got out of 2nd low and kept a slow 5mph speed up front. 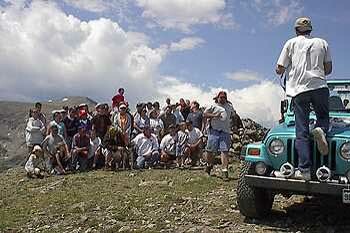 The HoboJeepers did a great job in moving everyone along. Everyone stopped at all 5 checkpoints and collected a survival item (worth points), and a card to make a high poker hand (Amanda H had high hand with a Queen high straight!). Marc & Sam had the last checkpoint, and handed out a kiss to every Hobo (Hersey Kiss that is!) and the last poker hand card. Tim Scully and his buds having a good time! 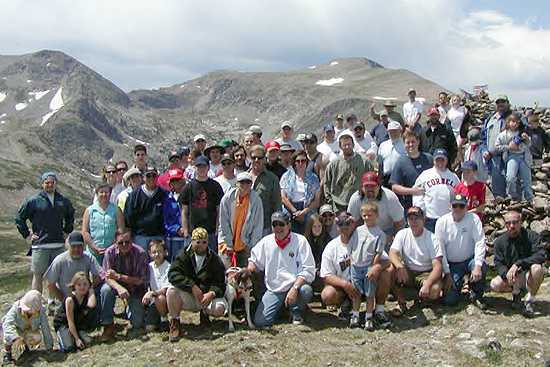 Once up at the tree-line lunch spot (treeline--about 11,400'), each Hobo brought up their "Where's Eugene?" guess, and the fresh unbroken egg (for points), then settled down with their lunch after being on the trail (train) all morning. 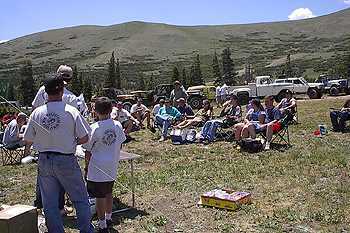 As the "official" HoboJeeper judges (Many thanks to Drew for the totals) tallied the points, each hobo received a really cool door prize based on the ticket in their goodie bags at registration. 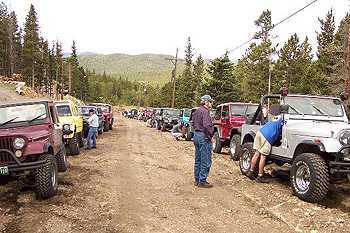 The list is long, as I handed out some really cool stuff, thanks to the many sponsors, including the local Denver 4x4 shops: Mile-Hi Jeep Rebuilders (Jim Dozal), High Country 4x4 (Al), and Exhaust Pros of NorthGlenn (Rick). The 'black nut' award went to Dennis E (who had the black nut around his neck), and won a fishing pole from Eagle Claw. Each hobo also compared the size of their nut to the person next to them to see who had the largest one. OK, footnote needed here: The nut in reference is a 5/16th inch steel nut on a string around their neck. OK?--, so Scott K had the largest nut (3/8th inch to be exact), and received an extra 100 points to his point total (did that make a difference??). He also received a plaque and a Leatherman as a prize for having the largest 'nut' on the run. This year we had a raffle which included about $1300 worth of nice items. We also raffled off the unclaimed door prizes. Thanks to all who bought tickets. Thanks also to our corporate sponsors for the raffle and door prizes. 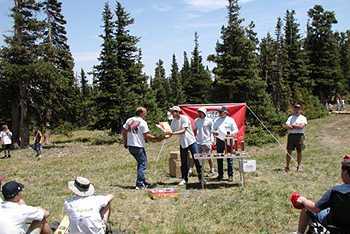 With the points tallied, the last place 'winner' was Don D (310 pts), and won a Delorme Colorado Gazateer Map Book. 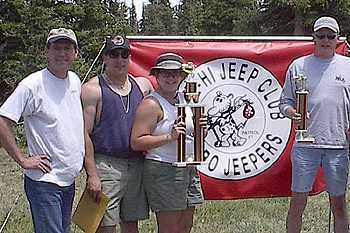 3rd Place trophy winner was Scott K (630pts), and won a $25 certificate to High Country 4x4, and the 2nd Place Trophy winner was Brent H (650pts) of MHJC Patrol 14, and won a $25 certificate to High Country 4x4. 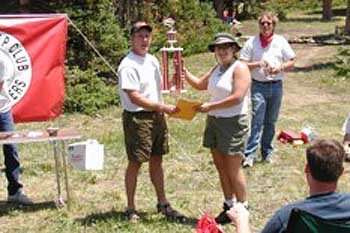 The "Top Hobo" of the 4th Annual Hobo Run 2002 went to AMANDA H with a total of 750pts! She also won a $100 certificate to 4Wheel Parts! Congrats to the trophy winners, and to ALL the hobos, cause we all had fun--which is a winning feeling in my book. 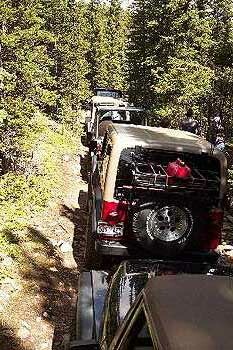 Everyone made it up both steep hills, as the second hill must of been graded for SUV's as it was not difficult at all. 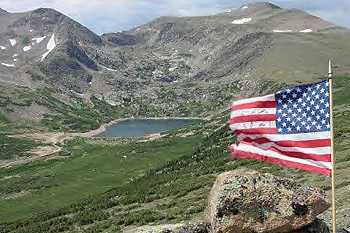 The views of the Front Range were beautiful as ever! 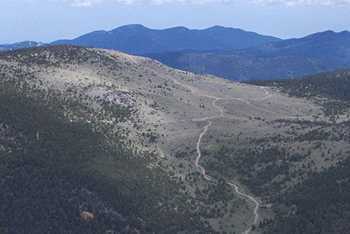 We reached the summit of Hobo Pass at 12,020', and stayed on the main trail down to the last steep hill before the rock house. 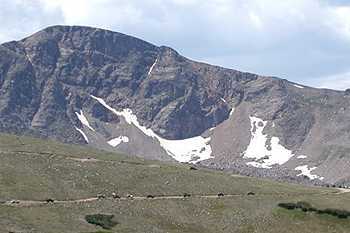 It was nice to see some clear air for a change as this summer's fires has not been good for Colorado's blue sky. 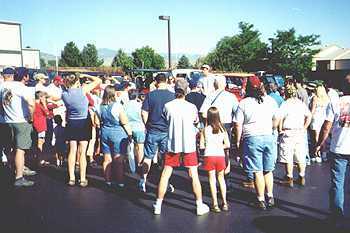 "Jeep, Jeep" Hobos for a day 2002!! 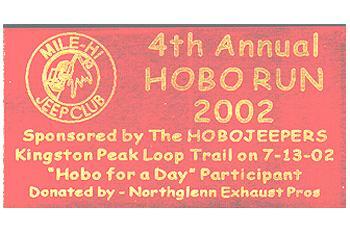 Thanks again to the "Hobos for a Day" for your support (you know who you are), hope you had as much fun as we did, and we look forward to seeing you next year in mid-July for the 5th Annual Hobo Run 2003!! -Welcome to Northglenn Exhaust Pros, a family owned and operated business specializing in the sales and installation of auto mufflers automobile pipes exhaust systems and catalytic converters for any make of car, truck, motorhome, or nearly any vehicle. 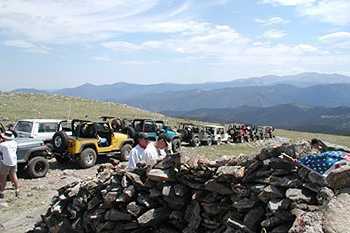 -High Country Performance 4x4 in Englewood, CO specializes in the sales service, and custom 4 wheel drive equipment. 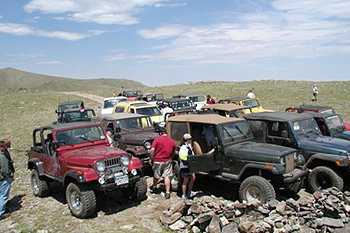 *4WHEEL PARTS- Wholesaler supplies aftermarket parts and accessories for Jeep and other four-wheel drive vehicles. *SUPERWINCH- Electric and hydraulic winches, 4WD hubs, bumpers, plus accessory products. 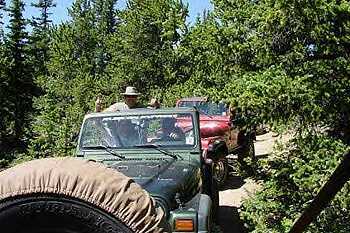 *FUNTREKS.COM- Guidebooks by Charles Wells (out of Colo. Springs-personally signed) cover back roads & 4-wheel-drive trails for SUV owners and serious 4-wheelers. 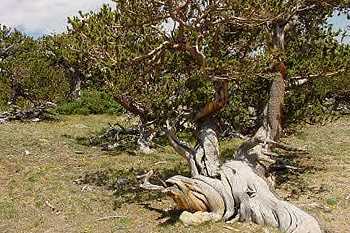 Books include directions, a map for each trail and hundreds of photographs for Colorado, Arizona and Moab, UT. 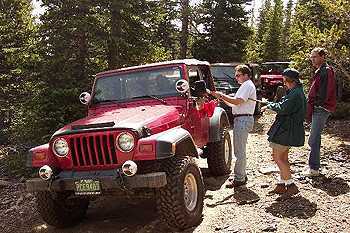 *BESTOP- Replacement tops and accessories for Jeep Wrangler, Jeep CJ, Jeep TJ and Jeep YJ. *DISCOUNT TIRE- Tires.com is your online source for name brand tires and wheels. *EAGLE CLAW FISHING TACKLE- Quality Fishing Tackle Since 1925. *PETERSON MANUFACTURING- Showcases driving lights, trailer lights and running lights for cars, trucks and commercial vehicles. *ZYMOL- Manufactures and Distributes Hand-Crafted Car Washes, Waxes and Finishes. *ADVANCE ADAPTERS- Provides numerous products such as transfer cases and conversion kits for transmission and engine swapping. *KEMOPRO- Automotive, marine and industrial cleaners, fuel additives, protectants, synthetic engine lubricants, oil treatments, car wash products, carnauba polishes, & waxes. *KC HILITES- Produces auxiliary lighting for cars and trucks, on road and off, recreational and competition. 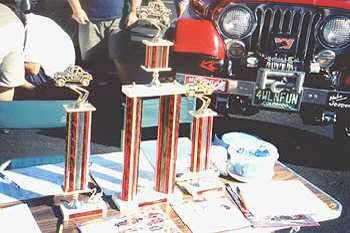 *TUFFY SECURITY PRODUCTS- Manufacturer of heavy-duty lockable security boxes for jeeps, trucks and RVs. Products are available to view and order online. 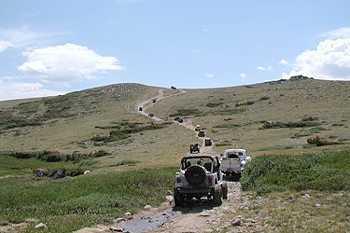 *TRAILQUEST.COM- Sells accessories and parts for Jeeps, 4x4 and off-road performance. *MEAN GREEN ALTERNATORS AND STARTERS- Mean Green Starters and Alternators are the ultimate alternative to stock. *MEGUIAR'S- Complete assortment of professional waxes, buffing compounds, and cleaners. 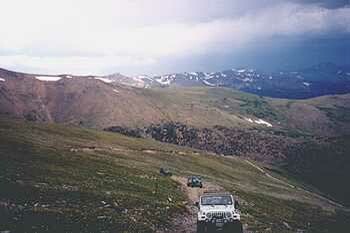 *SIDEKICK OFF ROAD MAPS & VIDEOS- Off road videos, off road maps and off highway guidebooks of trails in the US.